That's exactly how you were wired to live. Yet sadness, depression, and feelings of apathy and helplessness often characterize your life. You survive but not thrive. This audiobook is a treasure map that leads from monotony to adventure, from boring mediocrity to thrilling risk. Here are detailed directions to take hold of the power to live the kind of life you were created for and your soul longs for. * Discover the adventure hiding in the middle of the mundane. * Exchange the pain of unmet expectations for the joy of living with expectancy. * Get unstuck and take the first step that leads to a new body, mind, and spirit. * Kick guilt to the curb and experience real freedom. * Drive a stake into the heart of your everyday fears and dare to live again. * Tap into a power that will protect you whether you're crawling through the valley or standing on the mountaintop. Henry David Thoreau is credited with saying, "Most men live lives of quiet desperation." Not you! Not today! Not ever! 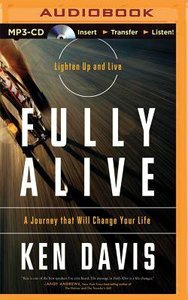 About "Fully Alive (Unabridged, Mp3)"
Best-selling author, frequent radio and television guest, and one of the country's most sought after inspirational and motivational speakers--Ken's mixture of side-splitting humour and inspiration delights and enriches audiences of all ages. His books have received national critical acclaim, including the "Book of the Year" award and the Gold Medallion Award. The video and audio tapes of his live appearances are in constant demand. His books include Sheep Tales, Lighten Up! Fire Up Your Life! Jumper Fables, How to Live with Your Parents Without Losing Your Mind! How to Live with Your Kids When You've Already Lost Your Mind! Secrets of Dynamic Communication and How to Speak to Youth...Ken has been the keynote speaker for hundreds of major corporate events. He is a featured speaker for Promise Keepers and a frequent guest on "Focus on the Family". Ken has made thousands of personal appearances around the world. As president of Dynamic Communications International, he teaches speaking skills to ministry professionals and corporate executives. Ken's daily radio show, Lighten Up!, is heard on over 1500 stations in the United States and around the world.